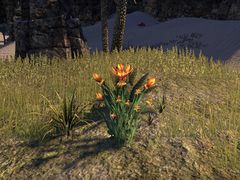 Silverweave is a plant with multiple orange-yellow bell-shaped flowers. It can be found in any zone by characters with Rank 8 in the Tailoring passive or 70 to 80. When harvested, a plant yields three to four samples of the raw material, Raw Silverweed, sometimes accompanied by crawlers or worms. Once ten samples of raw silverweave are collected, they can be refined into seven to ten pieces of the processed material, Silverweave, which is used for crafting pieces of light Silverweave armor at any clothing station. For you to be able to create silverweave armor your Tailoring ability has to be rank 8.